This petition has been created by Greg P. and may not represent the views of the Avaaz community. 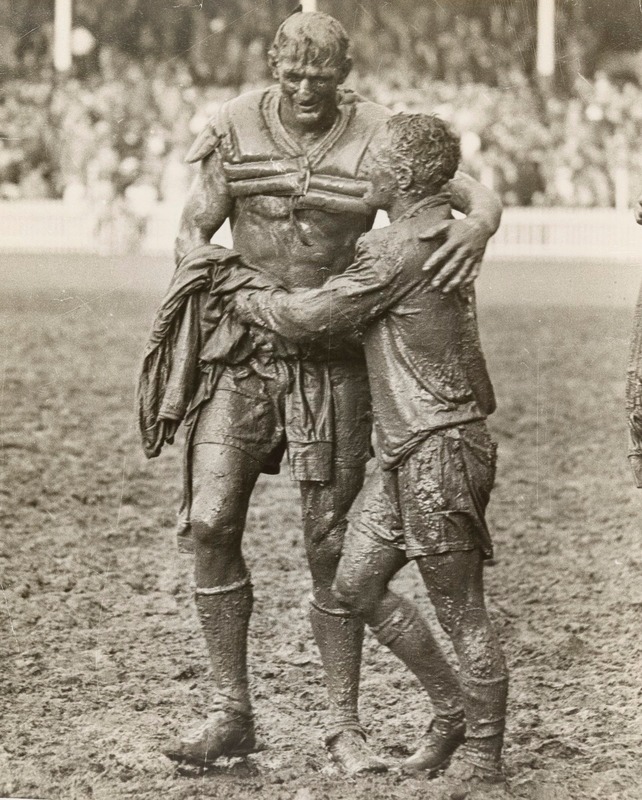 The NRL Grand Final Trophy replicates a famous photo showing the mud-splattered Norm Provan of St George and Arthur Summons of Wests (a foundation club) embracing as they leave the field after the epic 1963 Grand Final. The photo shows just what this games is - or should be about... it is a game for everyone, from anywhere of any size with the giant Provan towering over the Western Suburbs half-back. It is an iconic photo that reflects, for all sorts of reasons, on our national character. It now resides in the National Portrait Gallery. In 2000, Western Suburbs was forced into a joint venture with the Balmain Tigers (another foundation club). The new team would be known as Wests Tigers. Apart from one shining success in it's 6th season, the joint venture has failed at every level, culminating in the Balmain half of the deal being deep in debt and unable to pay it back. Meanwhile the Wests side of the deal continues to provide the financial blood to keep the joint venture going. The St George Dragons - Illawarra Steelers formed a joint venture in 1999. This was never a truly equal partnership however, with the new name of St George Illawarra Dragons now seldom, if ever used. The playing kit remained St George with the only real nod to Illawarra being the granting of some games at WIN stadium. As with Balmain, Illawarra found itself deep in debt in the years following the arranged marriage. But unlike Balmain, Illawarra found a savior in the form of WIN Corporation who paid out the debt and then bought out the shares. North Sydney Bears and Manly Sea Eagles also formed a joint venture in 1999, becoming the Northern Eagles. With the North Sydney side of the venture in debt, internal fighting and poor on field performances, the new team collapsed in 2002. All three of the joint ventures were caused directly or indirectly by the splintering of the competition by Super League - a rival competition formed by Murdoch's Fox network. St George dominates and is a stand alone club again in all but on paper. Illawarra is virtually an invisible entity in the joint venture with St George. North Sydney now plays in a 2nd tier competition. Manly - after the collapse of the joint venture with North Sydney, was able to resume in the NRL under their original strip and logo. Western Suburbs continues to carry the financial burden of the joint venture, while the NRL and the media continue to treat the Wests Tigers as nothing more than a rebranded Balmain. In short, joint ventures have been a massive failure with one continuing as a joint venture in name only, one dead and buried after 3 years, and one now on life support. This argument holds that the young generation of fans have no memory of the Magpies and would have trouble getting accustomed to a return to that name. The unspoken subtext of this argument is that the old Magpies fans will eventually die out. But we will not die out. We are not going away. The generational argument is fallacious. Everyone of all generations had to get used to the new Wests Tigers brand. A return to the Magpies would be no different. All generations will get used to it, just as they did in 2000. This has not been the case in the AFL where the Collingwood Magpies have been in first or second place in terms of member numbers (a key indicator of logo marketability) for many years, so this is another fallacious argument. Before the joint venture, Western Suburbs relocated to Campbelltown in the heart of the burgeoning MacArthur district. The club at that time however, was not having success on the field and that, combined with poor marketing and other factors, led to poor turnouts at the gate. It is an entirely different situation now with the club's financial situation much stronger, the team competitive, and the Campbelltown/MacArthur district booming. The district deserves and needs a permanent presence in the national league - not a half-baked occasional presence in the shadows of the now defunct Balmain. More than anything else, it needs it's own identity, not one reluctantly inherited from the bowels of the inner city. The marriage should be annulled, with the viable half being able to return as a stand-alone team based at Campbelltown - either named as the Western Suburbs Magpies or the MacArthur Magpies - with the latter probably preferable from a marketing viewpoint because it better represents the coverage area and simply rolls off the tongue better. This would also benefit the NRL because without a stand-alone team based in the MacArthur district, the void in having a presence in a national competition will eventually be taken by one of the other codes, signaling the possible slow death of the district as a league stronghold and a nursery of emerging league talent. Please help bring back the Magpies to the NRL by signing the petition!